Choose your battles: You only have so much time and energy, so focus on the areas that are driving you nuts. The fine china in the upper cabinet can stay dusty another year. The junk drawer at waist level needs help now. Spend time on areas where you will be ditching items: Cleaning and putting back what you have is nice. But real results come when you clean and get rid. The only reason not to dump 1/3 of the items in any area you are cleaning is if you plan to do absolutely no shopping during the upcoming year. Do a little at a time: This is especially helpful for boring areas like the kitchen. Do one shelf or one drawer every evening. Tip: Start with the liquor cabinet. There's always next year: Don't make yourself crazy. The older you get, the faster spring comes around again. Whatever you skimped on this year, you can hit hard in 2011. And if you skimp again, the Mayan calendar says it's all going to wash away in a global cataclysm anyway. I love the reference to global cataclysm while talking of spring cleaning. It works for me. 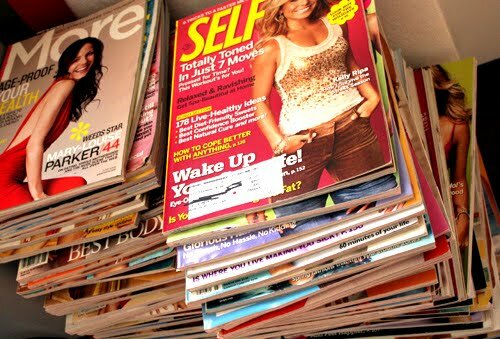 Drifting from fitness to blogging is no bad thing - I'd imagine there exist many more fitness magazines than blogging magazines, which will help counteract the hoarding tendencies. Starting with the liquor cabinet is just the job. All excellent advice. It's so easy to get overwhelmed. Best to break it off on small chunks and take frequent breaks. I began my spring cleaning a couple weeks ago... doing a little at a time - there is nothing better than the feeling after you have conquered an entire room or closet! A little at a time is the only thing that keeps me going with this (not that I take it very seriously in the first place). Last time I cleaned out my fridge, I did one shelf each evening... it was just too depressing, otherwise!